Artist’s impression of the disc of dust and gas around a brown dwarf Click to Enlarge This artist’s impression shows the disc of gas and cosmic dust around a brown dwarf. Image released Nov. 30, 2012. Observations of a brown dwarf suggest Earth-size planets can form around these "failed" stars, according to new research. 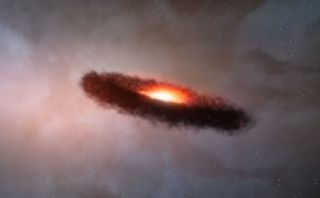 Astronomers found evidence of tiny solid grains in a disk surrounding ISO-Oph 102, a brown dwarf embedded in a star nursery some 400 light-years from Earth. Current planet-forming theory dictates that rocky worlds form over time as grains orbiting a protostar collide with each other and stick. Scientists previously thought that brown dwarfs have too few dusty particles, moving too quickly, for this process to happen. "Solid grains of that size shouldn't be able to form in the cold outer regions of a disk around a brown dwarf, but it appears that they do. We can't be sure if a whole rocky planet could develop there, or already has, but we're seeing the first steps, so we're going to have to change our assumptions about conditions required for solids to grow," added Ricci, an astronomer at the California Institute of Technology. This artist’s impression shows these grains of cosmic dust in the disc around the brown dwarf. Image released Nov. 30, 2012. This wide-field view shows the star-forming region Rho Ophiuchi in the constellation of Ophiuchus (The Serpent Bearer), as seen in visible light. This view was created from images forming part of the Digitized Sky Survey 2. Heated up by the brown dwarf's energy, the disk gives off radiation. The wavelengths of light emitted tend to be the same as the size of the grains, or smaller. The astronomers compared how bright the disk was in two wavelengths: 0.035 inches (0.89 millimeters) and 0.13 inches (3.2 mm). The brightness dropped off less than expected when observing at the larger millimeter size. Scientists took this to mean that some of the grains surrounding the brown dwarf must be at least 0.039 inches (1 mm) in size. ALMA is still partially under construction, and will be finished next year, but it began work in 2011using a partial array of dishes. When the radio telescope is completed, the research team added, scientists will be able to make observations with greater precision. "We will soon be able to not only detect the presence of small particles in discs, but to map how they are spread across the circumstellar disc and how they interact with the [carbon monoxide] gas that we've also detected in the disc," Ricci said. "This will help us better understand how planets come to be."